Well, the wait is over, Motion and Compressor have finally been updated! 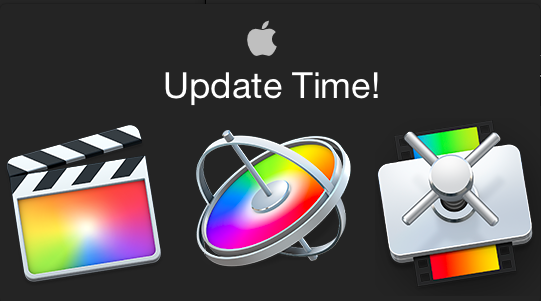 Oh, hold on… Final Cut Pro X 10.3 was released today too right? It’s been a long time coming and for good reason… it’s a major update, arguably the biggest yet. Since everyone on the internet will be writing about these updates in depth, I’ll be providing the TL;DR (too long;didn’t read) version for FCP X and talking about what it’s like to actually use it. Let’s start with the headline features, then go a little in depth. Add Roles on import manually or using iXML, in the Inspector, or TL Index. Remove all Effects or Remove Attributes. Check the release notes, there’s a lot more. New Pro formats, Full screen Timeline on a second monitor (and other 2 display options), XML Import into existing Events (loving this!). It’s pretty clear now why this took a while to appear, it’s kind of a whole new app. FCP X 10.3 will run on macOS 10.11.4 and up. As I said… Rather than just listing all the features – you can find those in the help menu or online – lets have a look at what it’s like to actually use this beast. Dark, flat, and in my opinion, way better to work with than the old version… I use a bunch of NLE’s and this version of FCP X is by far the easiest on the eyes. Many buttons, controls and Menu options have moved and/or been consolidated in a much more logical fashion. It takes a minute to figure out where everything is, but it really makes much more sense in day to day use. The Music & SFX Browser moves to the main browser window, and gains a skimmable waveform view. Titles and Generators now appear in the Browser as well. Put the Browser on a second monitor as I do at work, and it’s much easier to hunt for stuff. Also, you can now store Motion Templates in the Library if you want. You set this in the Library Inspector or by right clicking a Library in the Browser, very straightforward. Now when you share or archive Libraries, any custom Motion Templates can travel with it. This is a big deal for folks who collaborate on jobs and use custom Templates. Remember that any plugins that are not stored in the Motion Templates Folder will still need to be installed on all machines on which you open the Library. New settings allow editing and output in Rec.709 or Rec.2020 (Wide) color space. Compatible monitors are necessary for wide gamut display. You can set the color space for individual Projects, or an entire Library. Note that in order to change a Project from Rec 709 to Wide you must first set the Library to Wide. You can then flip individual projects between the 2 color spaces. In the Viewers, the option to display Range Check overlays has been added. Most people may not need this, but it’s essential for professional broadcast work. There are a few default sets, and you can now create and save your own custom layouts as well. New buttons have been added to quickly switch from single to dual monitors, Show/Hide the Timeline and Browser, and you can choose a myriad of different combinations of what you’d like to show in each Workspace or on either monitor. The option to put a full screen Timeline on a second monitor is one of my favorites. Save as many arrangements as you want. It’s very cool, very simple to work with, and very nicely done. Workspace settings can be easily revealed in the Finder to copy to other systems if you want. Another much requested feature, and it’s implemented really well. You can select a group of clips and remove all the applied effects if you want. Or, using a window much like Paste Effects, selectively remove any Transform parameters, Effects, or combinations of each. Very nice, and worth the wait. And here’s a treat for you… Match Color now can once again copied and pasted or saved with a preset, it’s no longer orphaned as it has been since 10.2.0. This is super useful. You can show the Inspector as you always have, or with a keystroke it expands to the full height of your monitor. Really nice to have this, especially with Effects that have lots of controls. You can now open Libraries that are stored on NAS drives via SMB. No fancy setups, hardware or voodoo needed. I have a 2013 Mac Mini running OS X Server with a bunch of Promise Pegasus drives attached to which I connect via a GB Ethernet switch, and it works perfectly for me. This ability was seen as a “missing” feature that is being put back in, but it’s one of those things that make one wonder what Apple has up their sleeve. For some reason I wasn’t able to copy existing Libraries on my computer to the server (likely a permissions issue on my end), but I’ve created new Libraries on the server and they work just like local Libraries. Waveforms and thumbnails refresh a tiny bit slower, but that’s probably due to the Ethernet speed, not FCP. Very nice to have this for those of us who work in collaborative environments. OK, here’s the thing everyone will be talking about… After revamping most of the other parts of X over the last few years, Apple have finally tackled the Timeline. 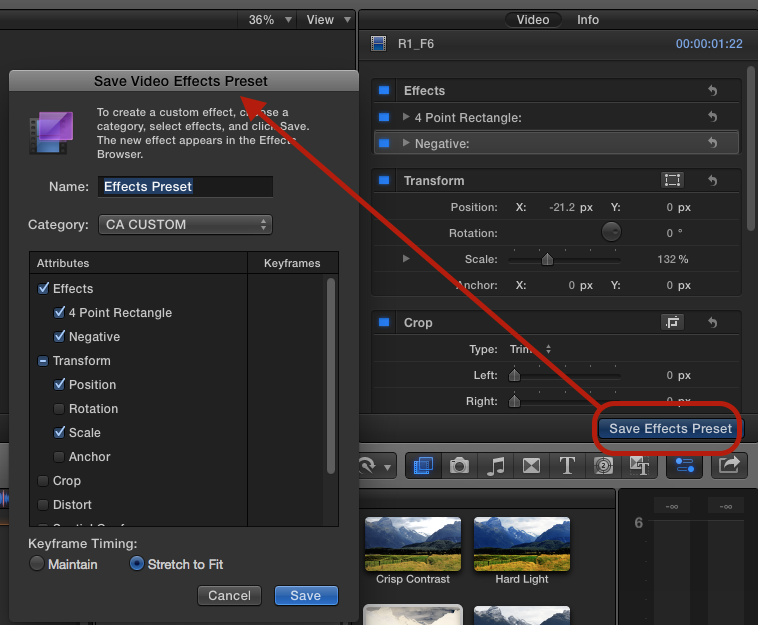 Roles, which have always been at the heart of how FCP X works, are now supercharged. What this means is that it’s more important than ever to assign and use Roles effectively. To facilitate this, you can now assign custom Roles on import, and you can use embedded iXML data to automatically assign Audio Roles when importing. You can also batch assign common Roles on components of multichannel masters in the Audio Inspector (no need for Role-O-Matic anymore), rename and assign Roles in the Inspector, in the Timeline Index, or by right clicking a clip, or selected group of clips, in the Timeline or Browser. In short, it is now much easier to assign Roles to clips no matter where you are in the app. Roles are of course searchable in the Index, and you can now search for clip types – Audition, Compound Clip, Multicam and Synchronized Clips. And something everyone has been clamoring for has appeared… you can assign colors to your Roles too. That’s right, Roles can be assigned different colors from a default palette. Now we can make our timelines look just as hideously colorful as Avid and Adobe! Kidding aside, it’s good to finally have this option. Any changes to Roles are Library based, if you always want different colors than the defaults, you’ll need to change ’em in each new Library. As always, making a “template” Library that you duplicate to make new Libraries solves this. Timeline 2.0 – The Timeline! In the default view, the timeline functions pretty much as it always has. The major difference is that Roles will “stick together” as much as possible. You can now re-arrange the Role order in the timeline by dragging them in the Index. I really love this feature. You can also “Focus” on a Role, which minimizes all other clips to almost microscopic size. The crazy thing is that you can still pretty easily work with these minimized clips. 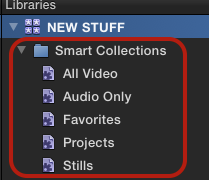 It’s a great feature which makes working on Projects with lots of stacked audio clips really really easy. You won’t be setting any keyframes on the minimized clip the timeline, but you can cut, trim, add Effects and transitions etc. It’s a godsend for people with smaller screens. One difference you’ll note is that clips may not stack quite as tightly as before. Roles can overlap in the default view, and you can still manually arrange clips around vertically, but a “lower” role will never move higher than any vertically adjacent clip from a higher ‘z-order’ Role. The other difference is that you can no longer put audio only clips above the Primary. Kind of a bummer, but ya gotta break some eggs to make an omelette right? The various Clip Appearance settings are slightly different as well, cycle through them and check it out. So… that’s the new default view, but there’s another new view that will blow your mind. Welcome to “Lanes View”. Enabling this in the Timeline Index puts each Role in it’s own separate Lane. It’s a new, powerful way of organizing an NLE timeline, without losing the the functionality of the Magnetic Timeline. You can choose to show one big lane for each Master Role and all it’s Subroles, or expand the view to show a separate Lane for each subrole. Put one Role in Lanes View and leave the others in default view, or any combination you want. Click the “Show Audio Lanes” button to change the entire Timeline view. The usual suspects will now say “FCP X has tracks!”. But this is not “tracks” at all, it’s an entirely new thing. Sure, you can re-order tracks in other NLE’s, but there is nothing that even approaches what the FCP X timeline can do with Roles and Lanes. Not even close. Seriously. Play with it, you’ll see. This is a really important new feature. Create a Compound Clip from your Project, select it in the Timeline, and use the “Show Audio Lanes” Button in the TL Index to expand out the individual master roles as clips. You can then apply effects to the Role(s), as well as to the CC “container” itself. Apply a VO preset to a Master VO Role, add some EQ to your Dialogue Role and drop a compressor/Limiter/LUFS Meter on the enclosing CC container for example. Select the Role (or the Compound Clip) in the Audio Inspector to make adjustments to intrinsic parameters and/or Effects you’ve applied. You can of course adjust levels for each individual master Role as well as the entire CC in the Timeline or Inspector. Essentially each Role in a Compound Clip is like a buss or subgroup that can be treated independently of other Roles and the CC itself. Incredibly useful for mixing and delivery and, if you think about it, there’s a whole world of possibilities this opens up. As noted above and in the Release Notes, there are many more new features, fixes, and improvements in this version. Way too many for me to go into in this post. FCP X 10.3 is also really fast. It opens faster (the UI appears first now, then the Libraries open), and runs as fast or faster than previous versions for me. Many of the changes made to the Timeline, Roles, etc. open up some very intriguing possibilities for future updates. Also, the majority of the big changes and additions in 10.3 are squarely aimed at professional users, which is a very good thing. 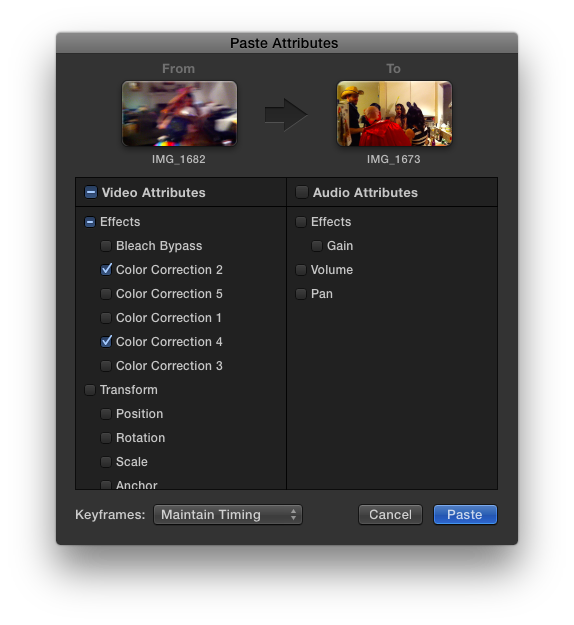 Almost more importantly, this version of FCP X is, as usual, a blast to work in. It’s stable, really great to look at, and the timeline view options and other new features are really a joy to use. My advice is to just get it and start poking around, it’s pretty amazing. Open all the Menus, explore the Command Editor… It takes a little while to discover all the new stuff and get used to how it all works, but that’s half the fun! Every Library I’ve updated – and I’ve updated some very large Libraries – has been fine. Any small issues I’ve run into have been easy to fix. The longer and more complex your Project the longer it’ll take to QC it in the new version but if you don’t mind spending the time, then go right ahead. Roles in existing Libraries/Projects that are updated may get a little screwy. I haven’t had any problems here, but be on the lookout for this. Using Lanes view and expanding Subroles makes tracking down stray/incorrect Roles very easy though. As usual, some 3’rd party plugins may have issues. I have, uh… lots of these, and for the most part everything has been fine. I’ve also heard first hand from some plugin developers that things are actually better with this than previous updates, but keep an eye out. 10.3 updates fcpxml to version 1.6, and apps that use fcpxml may not yet work with fcpxml 1.6. You can optionally export fcpxml 1.5 so in theory you should be OK, but the changes in Roles could cause unexpected problems when exporting to the older version. Again, nothing major that I’ve run into, but if you have mission critical workflows that use fcpxml, I’d run some tests to be sure. Of note… the latest versions of X2Pro and all the Intelligent Assistance apps work with fcpxml 1.6 now. EDL X works fine if you export fcpxml 1.5, and I expect it will be updated soon if it hasn’t been already. All in all, this is a very significant update, and it’s now apparent why it took so long. If you like FCP X, you’re gonna love it. 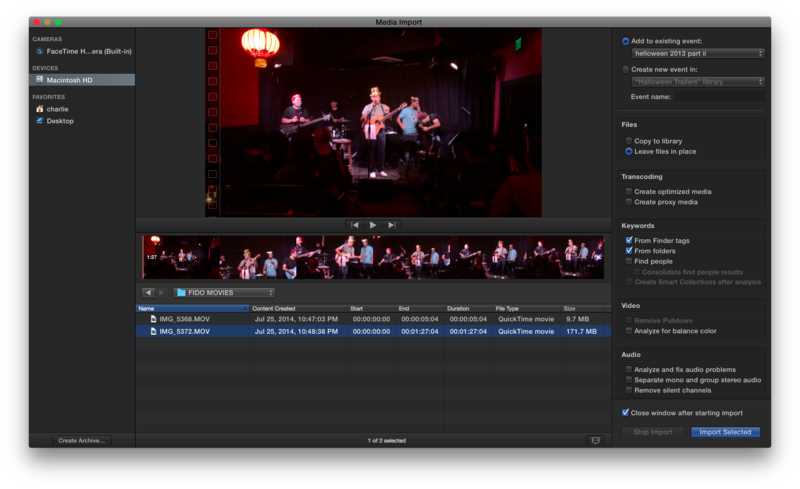 If you don’t like FCP X, give this version a try, it may just change your mind. Personally, I have a hard time going back to the “old” version of X when I need to, and working with track based NLE’s is now even more maddening. After the usual rabid anticipation, Apple today released FCP X 10.2 along with companion updates to Motion and Compressor. 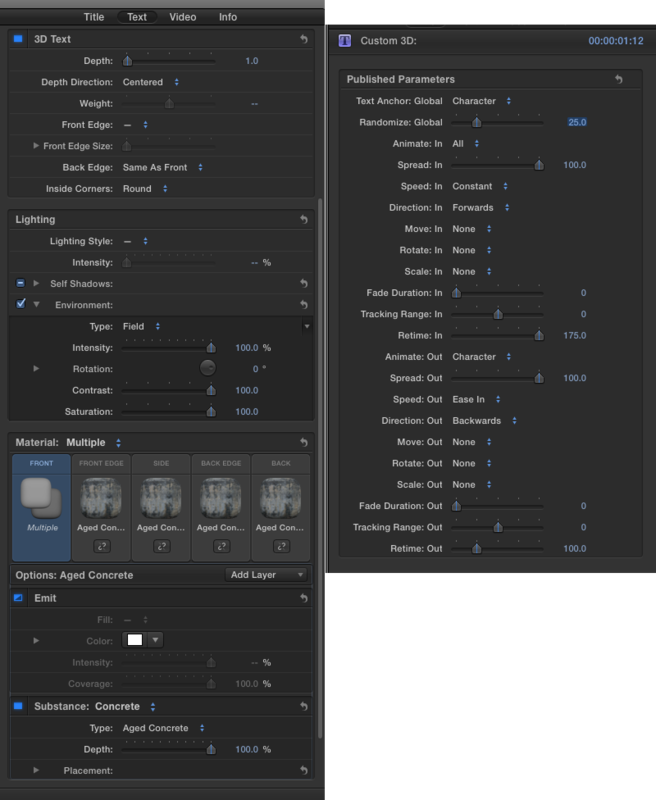 The UI has been subtly updated for Yosemite and there are some great new features; beautiful 3D text, the ability to save effects applied to clips – including grades – as custom presets, new and improved keyframeable masks, Library level Smart Collections, improved key framing performance, 4-Up Scope viewer, and a lot more. If you’ve been holding off on updating to Yosemite (at least 10.10.2 is required) you should, uh… stop holding off right now. 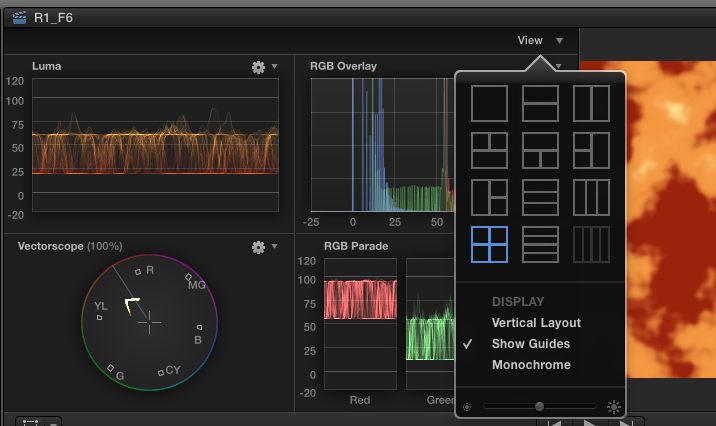 The FCP X team has done some crazy under the hood work to X, it’s almost like a different app. Very… snappy. There have been some legitimate past gripes about slow/stuttery UI, memory leakage, slowdowns, and just general sluggishness with certain projects. In some cases even crusty old FCP 7 felt more responsive than X. Well, that is no more. Done. FCP X 10.2 is fast, and performs much better than previous versions regardless of project length. UI animations don’t seem to slow things down, fast forward/reverse play is silky smooth and, for you old-skool types, J/L rock-n-roll scrubbing works just as you’ve always dreamed it should. lol In short, Apple has dialed this thing in amazingly well. It’s not a subtle difference, you’ll notice it immediately. Trust me, update your OS if needed, and install 10.2. Be aware that 10.2 will update your Libraries so, as always, make backups! My review of this addition? hmmm… I guess it’s “Holy Sh*t!” It’s the real deal, not some faked extrusion. Seriously, this is simply amazing 3D text. It looks as good as anything you could do in a dedicated 3D program, and basic titles will play back in real-time, unrendered. ** I’ve exported some 5k titles and it’s really crisp, no aliasing on the edges during moves, just gorgeous. You can also convert any 2D titles you’ve made to 3D with a click or two. While a lot of the animated moves are presets (which can be adjusted) the amount of control you have over the 3D environment is mind-boggling. There are hundreds of combinations of materials, lighting, edges, environments, shadows, etc. Yet, at the same time, it’s really simple. And if you need something other than the preset animation, you can open the 3D Title templates in Motion to add more lights, cameras, and tracking. Another huge feature that has been requested by many users. Any applied effects or adjustments to clips in the Inspector can now be saved as Effects Presets which will be available in the Effects Browser. The Color Board has been integrated into the new Color Correction Effect. Note: As this is now an Effect, the Color panel will no longer appear in the video tab in the Inspector. You must specifically apply the Effect to a clip to access the Color Board and Corrections. Similar to previous versions, the Color Board/Color Correction Effect can be quickly applied via the Enhancement Menu (or CMD-6). In 10.2, it can also be accessed by applying it via the Effects Browser. To add multiple Corrections, apply additional Color Correction Effect instances from the Effects Browser. Since it is now treated as an Effect, you can apply color correction before video filters, or insert multiple color correction filters anywhere in the stack of video filters. After you stack and arrange the processing order of multiple corrections and filters in the Inspector, you can save this look as an Effects Preset for for re-use. Also, when Pasting attributes you can now choose to apply specific corrections individually. 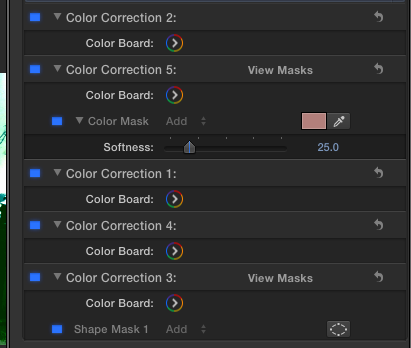 Other nice improvements – the Softness slider of Color Masks is now keyframeable, and Masks can now be renamed. Also, Shape and Color Masks are now available in every effect. 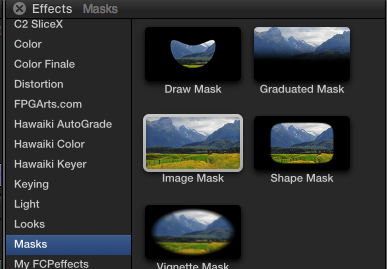 Great new additions to the masking capabilities of FCP X, masks now have their own category in the Effects Browser. They’re all easy to use and fully keyframeable. 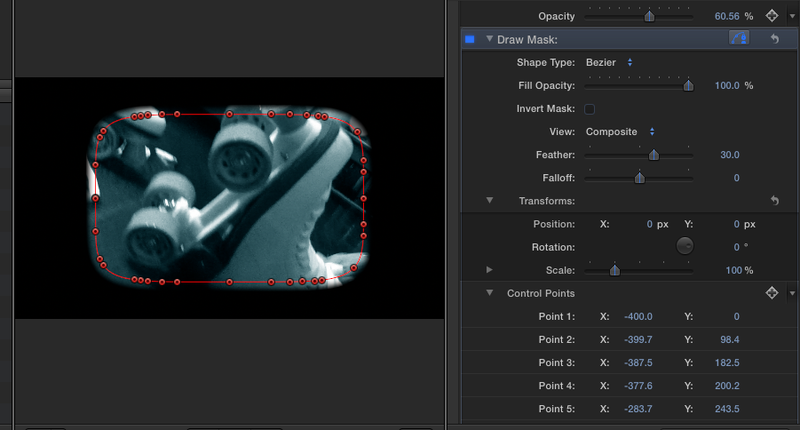 The new Draw Mask has options for linear, bezier, or B-spline smoothing. Lot’s of control, accurate, and very smooth when drawing. In general, key framing is much better overall in FCP X 10.2. The Shape Mask has been radically improved with much more detailed controls and better UI. You can now arrange and view up to 4 Scopes simultaneously. Happy? Create and save Smart Collections for an entire Library. X creates a Folder full of them by default, but you can delete them, change them, or make your own just as you do in an Event. Very useful. Optical Flow has been improved, and it looks amazing. If you have clips with Optical Flow in an updated 10.1.4 Library, when you select the clip you’ll see an additional, greyed out Optical Flow setting in the menu to let you know. You should choose the new setting and re-apply. The Import Window in 10.2 has been nicely re-designed, it kind of resembles Compressor now in that all the options are available in one sidebar. Much easier to see all your import settings at a glance. In addition to the photogenic features above, 10.2 also includes GPU rendering and dual GPU support when using Send to Compressor, GPU-accelerated RED RAW processing (requires updated plugin), support for Panasonic AVC-Ultra, Sony XAVC-S and JVC H.264 Long GOP. Motion and Compressor also include a slew of new, updated and improved features. To sum up… This FCP X update deserves the big version jump to 10.2 for the performance improvements alone. Apple has done a lot of work on the guts of this version, all the shiny new stuff is just icing on the cake. It’s a great update, and well worth the wait. One note: There have been some changes made to FxPlug under the hood as well, so if you use FxPlug based effects you should confirm with the vendor that they are compatible. I’ve had no show-stoppers, but I am an idiot that updates immediately and then puts out fires… and I have had a couple minor (to me) plugin issues. You should probably make sure, especially if you’re using these effects in ongoing work. So there you go. Install FCP X 10.2 as soon as you can. You will be happy you did.